If you’ve been on the hunt for a competitively priced Mazda oil change in the Algonquin area, look no further than Biggers Mazda. Our ASE-certified technicians can provide you with an affordable and effective oil change in no time at all. Read on to find out why oil is vital to your engine block, when to change your oil, and more about why you should choose Biggers Mazda to do it. Turn left onto IL-62 W./E. Algonquin Rd. Why is Oil so Important to Your Engine? 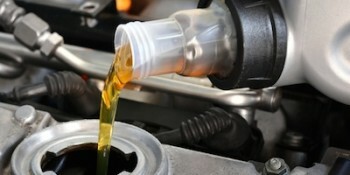 Oil lubricates all of the small moving parts of your engine. Because those parts move so quickly and so constantly, they’ll generate a tremendous amount of heat from friction if they aren’t lubricated properly. What this means is that if you aren’t regularly changing your oil, you’re at risk of overheating your engine, and thus, catastrophic failure, which is pretty much game-over for your car. To avoid that nightmare, we recommend a Mazda oil change about every 3,000 miles or 3 months. To be careful, however, it’s best to check your oil now and then before you’re due to ensure it isn’t dirty. If you find that your oil is dark rather than honey toned, you should go ahead and have it changed out early, as dirty oil is as good as no oil. That’s because it scums up your engine’s small moving parts, so that they create as much friction as they would if they were overly dry. When you get a Mazda oil change in the Algonquin area, it just makes sense to come to Biggers Mazda. That’s because we guarantee more than what may be the most affordable oil change in the area. When our technicians are under the hood of your car replacing your fluids, they’ll also perform a quick inspection while they’re down there to ensure your vehicle is working right. To top it all off, we offer a number oil change coupons and rotating service specials. Some of the most popular include a 10% discount on all maintenance/repairs for up to 100 dollars in savings, as well as a Spring service package that practically halves the price of a full tune-up. Scheduling for a Mazda oil change in the Algonquin area is easy when you fill out our online service request form. Or, if you prefer, you can also call Biggers Mazda at (866) 681-6469. Otherwise, just visit us at 1320 E. Chicago St. in Elgin—just 12 miles South of Algonquin. We look forward to earning your business!